Welcome to The Cooks Next Door -- a brand new blog whose goal is to inspire you to creativity in your kitchen, richer times with family and friends, and a greater enjoyment of the gift of food. We want to provide you with seasonal recipes that are delicious and achievable and encourage you in your efforts to provide a well-rounded diet to your family and friends. We plan to post daily, Monday-Friday, with at least one recipe each day that has been tested by us. We have some great topics to discuss, weekly features and even a few giveaways planned. Monday -- "Market Fresh": This post will focus on what is fresh and seasonal at the Farmer's Market (or supermarket) this week and give you a recipe for using it. Tuesday/Thursday -- We plan to use these two days each week to give you a variety of topics including: Ingredient Focus, Hospitality, Desserts, Simple Suppers, Gluten-Free Goodness, Tea Time, Soup Pot, Yeast Breads, and of course, Giveaways! Wednesday -- "Off the Shelf": Each week we'll pick a cookbook, food memoir, or magazine to review, and include a recipe for you to try. Friday -- "Weekend Fare": This feature will appear every Friday with something simple and delicious that you can enjoy over the weekend. We are very excited about all the wonderful recipes and posts we have planned. We hope you will enjoy this blog and find it helpful whatever your current place in life is -- cooking for one, cooking for a large family, learning to cook, or just enjoying the pictures. For today, here is a very simple festive snack everyone can enjoy. 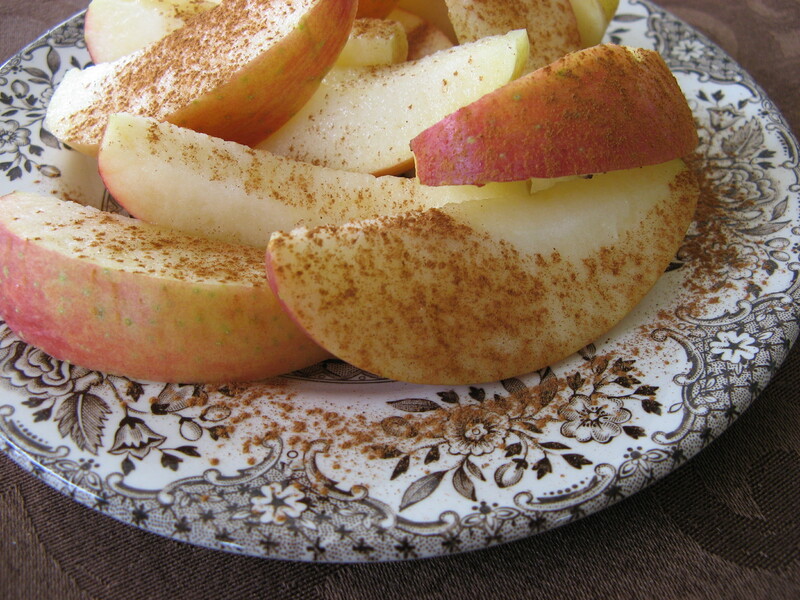 Place sliced apples on a plate and sprinkle with cinnamon. It's amazing how something so simple can taste so good! And now, to borrow the words of two famous cooks: Bon Appetit and Happy Cooking! i'm so excited! i love the themed days -- i'm really looking forward to seeing what you've cooked up! It is great!!! congratulations!!!! I am looking forward to it... go girls.... !!!! i am so glad to see this from the start! this looks like it is going to be very exciting - if you ever want a regional guest i am sure i could dig up a few lobster recipes ;). i am totally obsessed with julia child right now so cooking has been foremost in my thoughts. cheers to great food! What a great idea! Everything looks great... and of course is making me hungry! OH I love how you've set up your new food blog with different features for different days. . . It will be fun to come and check to see what is cooking in your neck of the woods.